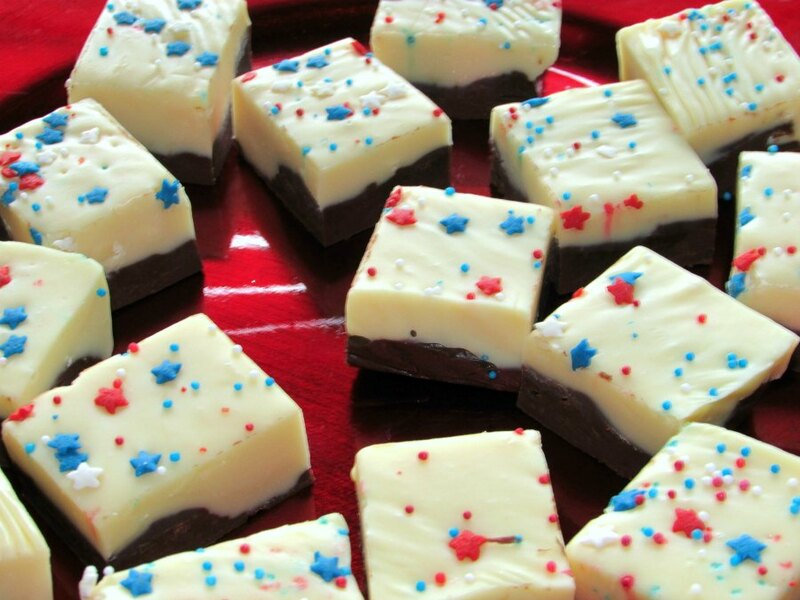 A layer of white fudge on top of chocolaty fudge is the perfect sweet and creamy treat. Ours is dressed up with fun sprinkles for the 4th of July, bu it could easily be adapted for any occasion. This is a quick and easy recipe for fudge. I have been making other quick fudges that include chocolate chips and a tub of frosting for holidays. This recipe is just as easy as those and I usually have all the ingredients in my pantry. I look forward to changing it up a bit for another occasion. Stir the milk and divide it equally between two bowls. Line a bread pan with aluminum foil and spray with cooking spray. Place the chocolate chips in the bowl with half of the milk. Microwave at 30 second intervals, stirring after each, until the chips are melted and smooth. Pour into the pan and smooth it out. Let chill in the refrigerator while you melt the white chocolate chips. Stir the white chocolate chips into the other bowl that contains half of the milk. Microwave at 30 second intervals, stirring after each, until the chips are melted and smooth. Pour over the chocolate layer and smooth the top. Add sprinkles or candy of your choice pressing them lightly so they adhere. Refrigerate until firm. Cut into squares and serve. Thank you so much for hosting! I hope you have a wonderful week! Yummy, this looks festive for the 4th! Glad to do #OMHGWW with you this week! I like the look of the pink fudge and mint chocolate shamrock fudge. Great to have you also linking up at #WednesdaysWisdom. Enjoy your party and see you next week! Thank you! MiMi has been having a lot of fun playing with fudge for the holidays! It is nice to have recipes that are easy and delicious. This is definitely one! Thanks for stopping by! MiMi has been really enjoying making fudge for holidays. Now that she knows how easy it can be, she is unstoppable! I usually have a hard time making fudge. But, I think I could make this and have it turn out perfectly. Thanks for sharing. I have a link party that I'm trying to grow. I invite you to share this idea (and a couple of others) at my Grandma Ideas Sharing Time link party at http://grandmaideas.com. My readers would LOVE this idea, too! The party goes from Wednesday through Friday at midnight so it ends tonight. I hope you can drop by and add your link before it ends. If not, you can participate in next week's link party. Thanks for stopping by! I will have to check that out! This is so cute and easy! I added it to my Patriotic Recipes post! Thanks for linking up at Totally Terrific Tuesday! Hope you have a Happy 4th of July! Thank you! Have a happy (and delicious!) 4th of July! This is a must try in my Kitchen! Thank you for linking up at the Tips and Tricks Link Party! Pinned! Hope to see you this Monday! Thank you so much Christine! Have a great week! Thank you, thank you, thank you so much for sharing this at my link party. I really appreciate it. I hope you'll continue to participate in the future! 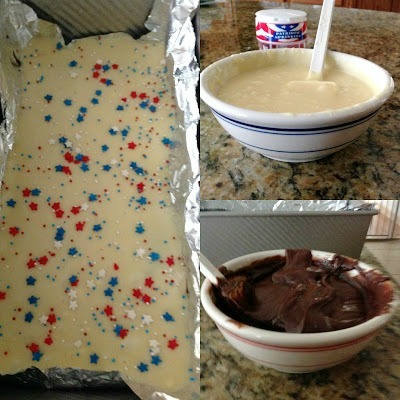 Your patriotic fudge looks delicious, Carlee! Thanks for linking up at our Celebrate the USA Party. Pinned to the party board. Thank you! I'll see if I can't come up with another patriotic post to share before it's all said and done. I'm surprised I don't have more already. So festive. A great favor to make for a July 4th celebration for guests to take home. That is a great idea, Ellen! Oooooh, I love peanut butter fudge! This is so easy, you can definitely do it! This fudge is so pretty! Easy, quick and yummy - can't beat that! Love how you could change the colors or add sprinkles for different occasions! Thanks! You could definitely make it for any occasion! Thanks!